Like many in the PowerBuilder world, you're probably eager for some news! Join us for an exciting and informative webcast from the PowerBuilder sphere: a panel of presenters from the community will be discussing the future of PowerBuilder and possible evolutions for your applications. A number of topics will be covered including PB15, PB & HANA, Upcoming PB Events, New PB add-ons and more! Sadly, I have just learned that SAP have displaced some of the best PowerBuilder engineering resources that I have personally known since PB creator David Litwack introduced me to the initial team at PowerSoft. The following people have made a huge contribution to the PowerBuilder product over the past decade and should be recognized (IMHO) for their significant efforts in enhancing PowerBuilder. I should also mention that recent departures signal the end of any North American engineering resources now working on PowerBuilder. The first person in my honour list goes to Reed Shilts, a recent departure from SAP engineering in Concord Massachusetts with a plethora of achievements in the PowerBuilder arena. I like to refer to Reed as Mr IDE as you can thank him for many of the productivity gains for the developer within the IDE such as AutoScript. Reed decided one day that PB classic needed such a feature and worked on prototype over a weekend to get the basic feature working. Of course today, we take auto-scripting for granted in PB Classic but it was the sole brainchild and initiative of this guy which brought the feature into play! I was first introduced to Reed as the leader engineer on PocketBuilder which was PowerBuilder's first venture into the mobility world on the Windows CE / Pocket-PC operating system. This product was a huge success and went on to win many awards. Reed also was pivotal in developing the CORBA and COMM support in PowerBuilder, then on to the new PB.Net IDE which taps into the Visual Studio Shell. In all these things, Reed often took the lead in designing, developing and architecting these best-in-class features. The next person I would like to acknowledge is David Avera who I like to call Mr DataWindow. David took over many of the lead design and re-engineering roles of the DW object compiler from its originator (and my friend Kim Sheffield). David started out by adding the Stored Procedure and Remote DW update capabilities into PowerBuilder. He then went on to design and code the DW.Net product which was a plug-in for Visual Studio. He then followed that up with the now famous "Web Service DataWindow" feature - a feature that I use all the time (even with my new favourite product Appeon). His latest contributions to PowerBuilder include the WPF DataWindow used inside of PB.Net and its corresponding .Net related painter. David is no longer working on PB and has been reassigned to work on the SAP Afaria product. All in all, both David and Reed have significantly contributed to the continued prowess of the PowerBuilder product over the past decade and deserve - IMHO - accolades for their outstanding work! I think that David Litwack and Kim Sheffield (the founding fathers of PB) would join me in saying that we (the PB community) appreciate your efforts on our behalf. Your exit from the PowerBuilder product scene is certainly going to be a loss for the entire PB ecosystem! Gentlemen ... we (the real PB developers) salute you! ISUG-TECH's New Membership Benefit - Appeon Mobile! New Member Benefit - Appeon Mobile! The International SAP Technical User Group is pleased to announce the immediate availability of their latest benefit for their Core and Gold Members - Appeon Mobile for PowerBuilder! The new mobility feature extends the existing Appeon membership benefit offering of Appeon Web with Appeon Mobile. The pair of products just released is also known as Appeon 2013. The new Appeon Mobile benefit is now available on ISUG-TECH's 'My Benefits' page. This new version of the Appeon software also includes the update to Appeon Web version 6.6. Appeon Web 6.6 includes new features like: new DBMS support for ASE (native driver), HANNA, mySQL; new cloud support in RackSpace & Amazon; enhanced QTP Automated Testing; SAP NetWeaver support; updated UI for AEM IE 10 & Windows 8 Native Support; and more! The newly-released Appeon Mobile 1.0 is only the beginning ... later this year the benefit will upgrade you to Appeon for PowerBuilder 2013 R2, which will include Appeon Mobile 2.0. This will become automatically available once Appeon releases the new version. The targeted new features for Appeon Mobile 2.0 will include: a local DBMS on the device and support for Android tablets and Smartphones! This is a truly awesome benefit for our Core and Gold members. If you are not an ISUG-TECH Core or Gold member or have a lower level of membership and would like to access this new benefit, you must upgrade your membership first. Corporate and Chartered members should contact support for more information. Congratulations to Appeon Mobile Top 14 Beta Testers! Appeon would like to thank all their Beta testers who actively participating in testing the new Appeon Mobile product by helping us develop and launch this fantastic new product. Appeon was extremely pleased with your valuable contribution, your passion and your expertise. The Appeon Mobile software is simpler and more intuitive to use, more efficient and builds on its award-winning levels of protection against the latest threats. Thanks to you, we’ve delivered a product with class-leading performance and usability to help users to mobilize your PowerBuilder apps instantly. Besides earning free products or other prizes, it’s a rewarding experience: you got to learn about new technologies, connect with people who share the same interests as you, contribute to the quality of a product and can become an expert in your community. For almost 5 months, Appeon thoroughly analyzed the product and have kept a daily journal with all observations, comments and suggestions from our customers. The feedback was integrated into the new builds and we could be able to see progress with every new beta release. We hope that this initial test will lead to a lasting active connection with you and we look forward to receiving your further feedback. Together, we will create the best mobility product for the PB community! Thank you for shaping Appeon Mobile ... Appeon Mobile Team! I was just putting together some information and slides for a presentation to my fellow coworkers on the high-level technical architecture that Appeon Web uses to webify any PowerBuilder Classic based application including ones built using the PowerBuilder Foundation Classes (PFC)! The main interesting aspects that I am always amazed at with the Appeon Web product are things like: removes the PBVM dependency, builds re-entrant & multi-threaded code, converts your 2 tier application into a 4-tier model, builds full 32 or 64 bit compliant code, includes its own Data Access Layer (DAL), supports all the popular DBMS systems (now including mySQL & HANNA), supports all the popular application servers, can deploy your PB application using either a J2EE or .Net architecture, provides its own security mechanism or allows you to integrate with LDAP, incorporates system monitoring, supports fail-over & load balancing, etc. To me .. that's a "whole lot of bang for the buck" when it comes down to adding up all the features you get right out-of-the-box! Web Browser: The Web browser delivers and runs the presentation layer of the Web application. Firewall: Port 80 is supported to comply with corporate security requirements. Web Server: The Web server hosts the presentation layer components for the Web application. The presentation layer is comprised of a set of HTML, XML, java script files and an ActiveX run-time library. 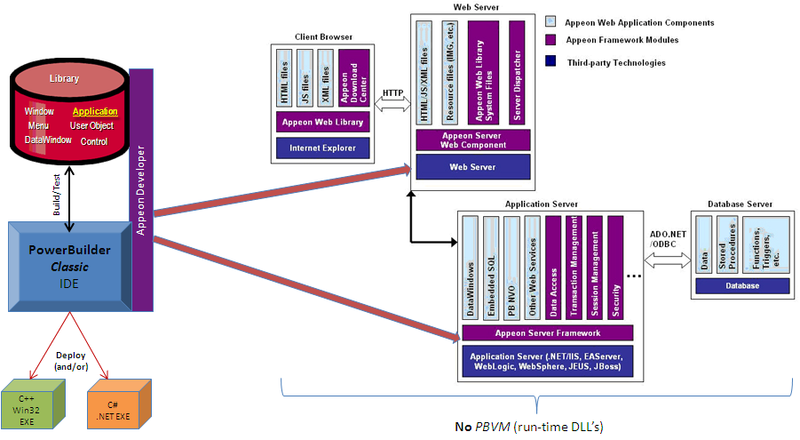 The Browser and Web Server exchange information using standard web protocols. Application Server (Java or .NET): hosts the business and data access logic for the Web application. Database: Existing DBMS & application databases used by the Web application. The Appeon Web product is actually delivered and utilized in various components. The first key component is the "developer plug-in" which integrates seamlessly into the PowerBuilder Classic integrated development environment. Server-side Integration like calling Web Services, .NET components, Java components, etc. The Appeon Web product allows the PowerBuilder developer to continue to use the IDE that they are most productive in and extend that into the web world by incrementally generating the web components that are needed and deploying these seemlessly as the programmer codes and saves their PB objects! Once the application is ready to test in the IDE, Appeon is also ready to test the web version ofr that application using the n-tier architecture of the web. As you can see in the above diagram, as the PB developer saves objects into any of their PB Libraries - Appeon Web translates that work into the language of the web and deploys the related components to their respective server(s). You can give the Appeon Web system a try by downloading the trial version from Appeon. For those of you who are ISUG-TECH members at the Core (previously called "green") or Gold level, you can get the Appeon Web "developer" version for free as part of your membership. Give Appeon Web a try .. you will be amazed at what it can do and why you did not try it sooner - Chris! SAP Sybase SQL Anywhere Optimizer improves performance by dynamically analyzing queries and the surrounding machine state, such as CPU speed, available RAM, and more. The optimizer uses this information to generate an execution plan that minimizes runtime. In this newest version, the optimizer can evaluate a much broader set of access plans during query optimization. The optimizer also has the ability to take better advantage of system resources to improve parallelism, which further increases performance for complex reporting and analysis queries. The synchronization process has increased scalability and performance with synchronization performance improvements to the communications protocol and to the threading model used for synchronization. The new profiler and updated synchronization modeler make it easier than ever to manage the full synchronization lifecycle, from design, to testing, and to deployment. In addition to being able to synchronize data from remote SAP Sybase SQL Anywhere and UltraLite databases to a HANA consolidated database, the SAP Sybase SQL Anywhere remote data access feature now allows developers to run ad hoc SQL or create proxy tables against a HANA database from a SAP Sybase SQL Anywhere connection using the new HANAODBC remote data access server class. You can also connect directly to HANA database from DBISQL. A complete set of system privileges and roles increase security by following the principles of least privilege and separation of duties. A system privilege has been created for every privileged operation that can be performed in the system. When a user is assigned the role database backups, for example, that person has permission to do backups, and nothing else. A user could also be given permission to manage users and login policies. SAP Sybase SQL Anywhere 16 encrypts and decrypts data using standard encryption algorithms, ensuring that data is not compromised when it is imported into and exported out of the database. The ENCRYPT function can encrypt data inside the database server and then it can be output into a raw format so that it can be decrypted outside of the database (with the key). Also, the DECRYPT function can decrypt data encrypted outside of the database server. Disk sandboxing limits vulnerabilities by locking down the server and limiting read-write file operations executed from the database server to the directory on the underlying file system where the main database file is located. When disk sandboxing is enabled, relative path names are treated as relative to the directory where the main database file is located. When disk sandboxing is not enabled, relative path names are relative to the working directory of the database server. Database mirroring helps maintain system reliability and improve performance in heavy read applications. If the server fails or the system must be taken offline for maintenance, a live, mirrored version will come online to maintain availability. Administrators can now change the mirror system configuration and add or remove nodes without taking the system offline. Events can now run on the mirror server and copy nodes in mirroring and read-only scale-out systems. The database server is more robust when dealing with fatal errors. When a database specific assertion occurs, for example, the database server can now take only that database offline, leaving the server up and available for any other databases still running on it. Similarly, on the client side, if a client receives an out-of-memory error while executing a database operation, rather than terminate the application, the database client now returns the error to the application and gives the application the opportunity to handle it. The database server now supports the creation of new indices on tables without requiring exclusive access to the table for the entire duration of the create index statement. Users can continue to access the table while the index is being created. Application developers can use event tracing in production systems with minimal performance impact to more easily debug and troubleshoot application issues. Event tracing records information about system-defined and user-defined trace events to an event tracing target. A trace session is made up of trace events (specific points in the database server software or your SQL application) that collect information that is logged to a target, such as a file). Event trace files can be merged, filtered, or translated to readable forms such as text or XML. SAP Sybase SQL Anywhere has added web services support. The OData Server allows web clients to communicate with an SAP Sybase SQL Anywhere database server using the OData protocol. Web clients can send OData requests to a configurable OData Producer hosted in an HTTP server, which converts OData concepts into relational database operations. SAP Sybase SQL Anywhere simplifies programming and makes it easier to access data with new support for ROW and ARRAY data types. A ROW constructor and an ARRAY constructor support composite data types that can be used as variables, procedure parameters, and function return types. SQL functions and procedures accept ROW and ARRAY data types as IN, OUT, or INOUT arguments.